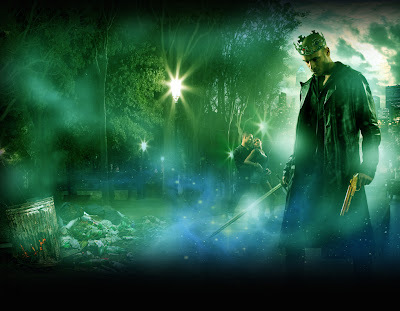 Earlier this month in a weekend report, I posted the cover art for the urban fantasy King Maker, the first book in Maruice Broaddus' The Knights of Breton Court series. Here is the artwork for the second book in the series King's Justice. Check out Maurice's blog for more details. I loke the atmosphere of this cover! My husband and I love Maurice's cover art and have been using the previous one as wallpaper on our home computers. This new picture is just as good as the blue one... hmmm... we may have to go buy the books to go with the art now. Alex the idea of modern knights and urban fantasy is a great combination. Susan I have to say my favourite is the first cover but they do make a powerful set. I have to say this picture is a real eye catcher. There are so many things to see in it. I really do like this one. Melissa great artwork for both covers and completely different from most UF covers.